Windows 7 operating system supports multiple user accounts creation, which can be assigned as either administrator or standard user account type, in addition to a guest account. However, after a user account is created, it’s only possible to be deleted or removed, and administrator cannot disable or deactivate the user account from within the Control Panel user interface. Administrator may need to temporarily or permanently disable or deactivate a user account, without deleting or removing the user account completely from the system. 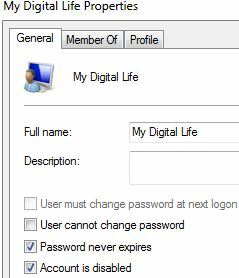 In order to disable or deactivate user account, follow the following guide. Disabling a user account allows the account to be re-enable or re-activate in future, without loss of data. Go to Control Panel -> System and Security -> Administrative Tools, and then open Computer Management. Alternatively, right click on Computer in Start menu, and select Manage. Expand Local Users and Groups branch. Right click on the user to deactivate, and select Properties. Select and tick the check box for Account is disabled option. Click OK and close Computer Management window. The user account is now disabled, and no longer can be used to log on. Tip: Uncheck the Account is disabled option to re-enable the user. Replace user name with the actual user name of the account to disable. Note that user name with space in between must be enclosed with quotation mark (“). More tips and tricks on using Windows 7 available.